Dominoes have become a staple in most primary classrooms. They build upon dice patterns and are often used to model decomposition of numbers, building student knowledge of addition facts. They are an excellent manipulative for primary students to use and these are some examples of how students might use dominoes in the math center. The student needs some dominoes, counters and a domino mat. The student selects a domino and builds that domino on his/her domino mat. Next, the student counts the total number of dots on both sides of the domino and selects the correct number card to represent the total. The student may record this domino on the Domino Recording Sheet before clearing the mat, and choosing another domino. Differentiation: Teachers may easily differentiate this activity by providing differentiated baggies of dominoes that effectively target the varied instructional levels of students in their classes. For example, an easy set may include dominoes with sums less than or equal to 6 while a challenging set may include dominoes with sums greater than 12. Instructional Strategies: Read more about Using Domino Math Mats in the classroom to help students build number sense and learn fact families. Print out a Double-Six Domino Flash Cards Set on card stock and laminate for classroom use. 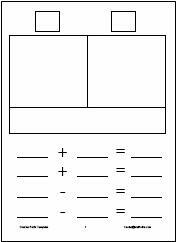 Download the Domino Flash Cards 2 set to extend the original Mathwire double-six to create a double-nine set that may be used in the classroom for addition and subtraction activities. Small Student Domino Templates: Print out Dominoes for each student to keep in his/her desk as an alternative to actual dominoes. If printed on cardstock and cut apart, these would also be useful to send home for family play. Domino Mat: Give each student a Domino Mat and counters to use in classroom activities and games. Domino Facts Mat: Give each student a copy of the Domino Facts Mat in a sheet protector so that student can use a dry erase marker to write the fact family for a given domino. Domino Record: Give each student a copy of the Domino Record to draw the domino and write a corresponding number sentence during class or math center activities. 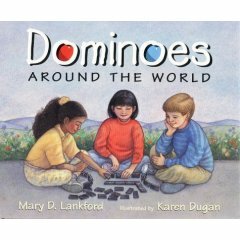 Dominoes Around the World by Mary D. Lankford discusses how domino games are played in different parts of the world. The book includes directions for each game as well as pictures of children playing the games. Introduce elementary students to more domino games by reading this book. Check out more domino games at Domino Plaza. Four students think Mrs. Lopez is going to have them celebrate 100 days of cool, so they arrive the first day in wild outfits. The numberline countdown to the 100th day continues as they struggle to think up new "cool" outfits each day. After making it to the 100th day party, the students question what they'll do tomorrow now that the cool stuff is over. See additional activities in the back of this book, as with all Stuart J. Murphy MathStart books or visit Stuart J. Murphy website to view suggested activities for his books. Consider using Murphy's Domino train idea to celebrate the 100th day of school. Students must make a domino train by placing dominoes end-to-end. The train must have exactly 100 pips or dots. 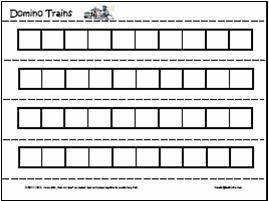 Download Domino Trains template for students to use to record their 100-dot trains. Students draw in the dots, then cut apart on the dotted lines and assemble to create long trains. Younger students may record the number of dots beneath each domino and use calculators to verify the 100 dots answer to their long number sentence. Teachers might create a class list of "different ways to make 100" by collecting student number sentences from their domino trains. Challenge students to find the shortest train possible. Try these domino games with students to improve math skills and number recognition. Encourage students to play these games at home with their families, using real dominoes or paper copies. Let students play the Domino Parking Lot Game to practice finding the sum of dominoes. The game mat and recording sheet are both available for download as PDF files. Have students use a recording sheet while playing this game during center time so that you may easily monitor their work as you walk around the room. Play the Domino Flash Game often during transition periods to help students see the domino patterns and recreate them on their own domino mats. The domino Muggins Game helps students learn multiples of 5. The dominoes are played as in the normal domino game, but students score points if the open ends sum to a multiple of 5. This game encourages students to try out different dominoes in an effort to find the play that yields the most points. Differentiate play by using a double-nine set or double-six set to best meet the varied needs of students in your class. Muggins 10: Modify the Muggins game to be Muggins 10 where students get 10 points for adding a domino so that the open ends sum to 10. "Ten" facts are such a critical math skill so this would also help students master these facts. Domino War is great for students who need to practice counting pips and deciding whose domino is larger or smaller, depending on the variation you're playing. Students will practice multiplication facts as they play Domino Maze. Students will have to really think about dominoes as they solve Garage Sale Dominoes. A sample solution using an orderly list is included in the pdf file. After students have solved Garage Sale Dominoes, challenge them to solve More Garage Sale Dominoes where they must figure out how many different dominoes there are in a complete double-nine set. A sample solution using an orderly list is included in the pdf file. Challenge middle school students to solve Math Forum's Domino Activities. These sites provide additional domino activities for students. Find rules for more domino games complete with scoring examples at Domino-Games. Domino Math uses dominoes to teach the commutative property. Be sure to actually have students turn them around so that they read the flip fact. Your older students (or their parents) will be amazed at your mathematical prowess as you execute this domino trick. You might want to have calculators on hand with the dominoes for your initial presentation, as the trick won't work if participant's mental math skills are weak. After that, students can try the trick on each other before using the trick at home with parents and siblings. Challenge middle schoolers to use algebra to explain how the trick works. Robert Bosch creates portraits using sets of dominoes. Students will enjoy this offbeat use of dominoes so plan to visit the site online to view some of Bosch's creations. Don't miss the section for educators where you may download pdf files should you decide to create your own portrait of Abraham Lincoln, Martin Luther King, Jr., the Statue of Liberty or the Mona Lisa. Visit the Domino Artwork website to view the portraits and see portraits created by school children using Bosch's PDF materials.